Learn to play the taiko drums & develop your taiko drumming skills with top instructors - the senior members of Mugenkyo Taiko Drummers - at their very own purpose-built base & rehearsal space in the Scottish countryside, open to the public for a handful of weekend workshops each year. The Introductory Weekend Workshops are open to adults of all ages & are accessible to all. 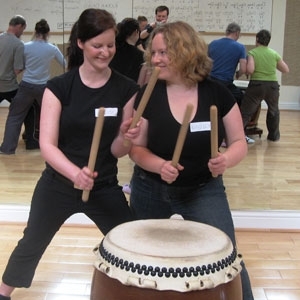 The Follow-on Weekend Workshops are for those who have completed a weekend with us, or for those who play taiko already.